UPDATE: I have updated his review to reflect the importance of skills. The developers have reached out to me to clarify skills are vital to equalising teams. Football is a game of skills, athleticism, luck and strategy. Football video games however, have tended to be pretty action-centric and lacking on the strategic aspect. 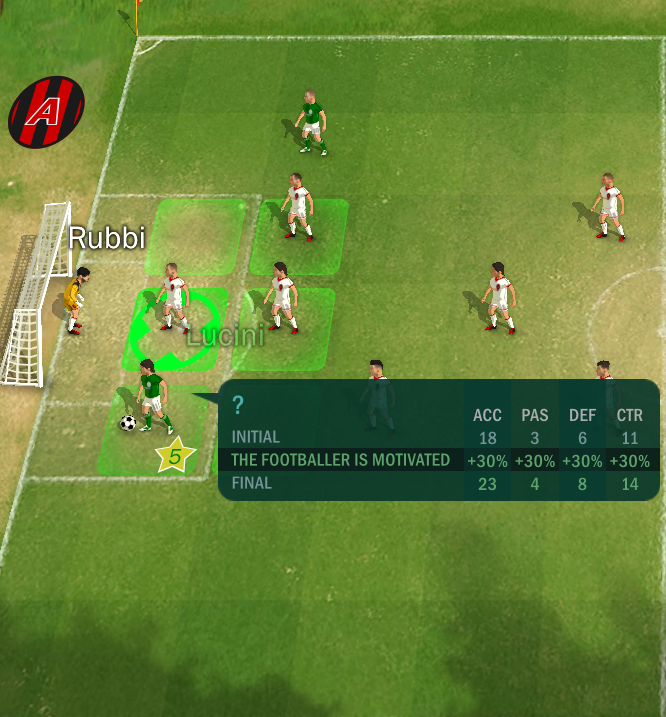 Football, Tactics & Glory is one of the few football games rooted in the strategy genre. Here’s my review of it. Football, Tactics & Glory is a turn-based strategy football game that attempts to mimic the tactics of real football. It uses dice roles or a random number generator to decide whether each action you take on the football field succeeds. This randomness, the developer argues, actually is true to football since even the best players can miss absolute sitters or fluff a pass. There a decent amount of options in creating your team. You can come close to recreating your favourite team. Here's my AC Milan. Your player’s effectiveness in completing moves depends on their attributes. Thankfully, Football, Tactics & Glory keeps it simple by using only four attributes. Unlike other football sim/management games, this makes Football, Tactics & Glory relatively easy to pick up and play. These attributes influence everything you do in a match. Each of them is used for a particular type of action. All the stats contribute to a number which is called ‘potential’. This is basically the potential for a player to successfully perform the action and will be compared to the opposition player’s potential to block your action. Used to calculate the success of shots on goal. The players potential (which is based on accuracy) is rolled against the defenders potential which is based on the defensive attribute. How good your player is in passing and playing a lofted pass. An absolutely vital stat for midfielders as their primary role as the impetus for your attacks. Defence is used during interceptions, tackles, and blocking shots. This attribute is also the primary stat for goalkeepers. How well your players control the ball. Used when you players dribble, run on the flanks, receive lofted passes. You’ll be judging the ability of your player to successfully complete an action on their potential when you select an action. Potential is visually shown in a colour coded number to hint at you the chance of completing actions. The basic rule of thumb? Just make sure your number is bigger than the opposing player’s number, and your player will succeed. This is true probably 95% of the time. Sometimes the game will surprise you by letting the player with the lower potential to win the roll. The more your player gets frustrated, the more motivated they become. There are certain things that can modify your player’s attributes. A tired player will get a penalty to his stats. Rainy weather can impact the passing attribute. There’s also something called Sporting Anger. The more a player gets frustrated. His pass gets intercepted or he is tackled successfully, his motivation builds up. This is represented by a star icon. Once the star icon is filled up, he gets a temporary 30% boost to his attributes. In essence, simulating that the player is playing harder and trying his best to outperform the opponent. In Football, Tactics & Glory each side takes turns to take actions. This might seem counterintuitive to the game of football. After all, football is a fast-paced, fluid real-time sport. But surprisingly, Football, Tactics & Glory manages to do a good job of mimicking the tactical side of the game. Most of the time. Each turn is limited to three actions. So if you tackle the ball in defence, pass it to midfield who then passes it to a striker, you would have used up your turn. If there’s an opponent between your player and your target, the game calculates the potential of an interception. Football, Tactics & Glory clearly shows your chances of performing an action. Green number mean high chance, red in your dreams buddy. You're going to need a very high-leveled striker to make this shot. This makes the use of open space on the field, critical. The fewer opponents that are in the way, the higher your chances of passing or scoring. But three turns is hardly enough to attempt a shot on goal if you’re playing the ball from defence (shooting at goal takes one action). This is where your player’s skills come into play. Skills, Do You Have Em? To play well and get the upper hand (or rather leg) over your opponents, skills are absolutely critical. If it succeeds, a skill is basically a free action allowing you to save precious actions for other things. Some skills are suitable for certain positions. Sliding Tackles are useful for defenders, long pass for midfielders, nutmeg for wingers, rainbow feint or cannon shot for strikers. The only drawback to skills? They have a lower chance of success compared to a regular action. So there’s an interesting choice to make when you’re one goal down and hard-pressed to use your turn more effectively. Do you take the risk by using your skill to save your action or do you play it safe and pass it to a player to hold the ball? Because when your player holds the ball, he gets a bonus modifier to the Control attribute, making it harder for the opposing team to steal the ball away. Giving you the chance to continue with your play when it’s your turn. Formations are super important. To setup the right formation, you need to study the opponent and figure out their key payers. Put your strongest defenders to face their best strikers and exploit their weak players by placing your best attacker facing them. It’s cool that the game in this aspect is much like real football. Playing straight boring football might get you the results if you use the right tactics or formation. But skilful play means taking more risks but the payoff could be a lot bigger. Skills can also be super important when you take on teams with much better players. While attributes may put your team in a huge disadvantage, train tohose skills up and you might just cause an upset. If Football, Tactics & Glory was just the tactical matches, the game would get stale real quick. The AI isn’t the sharpest and some moves feel just too gamey. It feels like you’re exploiting the game, resulting in an almost certain goal. You’d just rinse and repeat that move to destroy the opposition. But there’s more to the game. It also has a strategic layer. It’s the team management aspect which bolsters the game to be much more replayable. The more matches you play, the more experience your amateur players get. As they level up, their attributes increase. The more they rank up in their role, they get to upgrade their talent (think of talents as passive skills, such as automatic interception). You get to invest in club improvements as well, upgrading your coaches or your stadium. And then, of course, there’s a transfer market. There's the strategic club management layer to the game which makes it ore interesting. You don’t have the ability to drill down to the player you want. You get a selection of random players. Want more? Pay your scout some money and you get a new bigger list of random players. It’s not the most in-depth team management system, but it’s just enough to keep the game interesting. But in some ways, it manages to do just that with a neat but simple match system. It may not be as complex as a Football Manager title, but it isn’t designed to be a simulation. It’s an abstraction of the beautiful game. The entire strategic layer of managing your team, buying new players, training them, upgrading your facilities and staffs, all add up to the long-term replayability of Football, Tactics & Glory. There are negative points with the AI doing some not so smart moves, unfairness of facing an unbeatable team with better players, an uncomfortable amount of grind to get your team to level up by gaining XP, and repetitiveness when you’ve found your winning formula (the AI doesn’t change its tactics too often to adapt to the situation). Also the music is pretty bad. Just mute the music and listen to your own stuff. But all in all, looking at the entirety of the game, it achieves its aim of showcasing football in a unique new way. It’s got a good foundation. I can only hope that the devs balance things out better with less grind, improve the AI, and work out the flaws of the game. *This article makes use of an affiliate link. It's how I earn revenue to maintain this blog.